Some of the more fundamental discoveries in modern biology were facilitated either by the study of viruses, or by use of viruses as tools for exploring host cell mechanisms. The foundations for this work were laid by Felix d’Hérelle and others, working after 1917 with bacterial viruses in cultured bacteria. Indeed, Macfarlane Burnet’s first important work was in 1929, showing by use of plaque counting that a single bacterial cell infected with a single phage produced 20 – 100 progeny some 20 minutes following infection. The fact that phages adsorbed irreversibly to their hosts as part of the infection process was shown by AP Krueger and M Schlesinger in 1930 – 1931. Schlesinger later showed between 1934 and 1936 that the bacteriophage he worked with consisted of approximately equal amounts of protein and DNA, the first proof that viruses might be nucleoprotein in nature. However, it took until 1939 for the former physicist Max Delbrück, working with the biologist Emory Ellis at Caltech, to elucidate the growth cycle of a sewage-isolated Escherichia coli bacteriophage in a now-classic paper simply entitled “The Growth of Bacteriophage”. This used the simple technique of counting plaques in a bacterial lawn in a Petri dish, following infection of a standard bacterial inoculum with a dilution series of a phage preparation. Their principal finding was that viruses multiply inside cells in one step, and not by division and exponential growth like cells.. This was determined using the so-called “one-step growth curve”, which allowed the accurate determination of the titres of viruses released from bacteria that had been synchronously infected. This allowed calculation of not only the time of multiplication of the virus, but also the “burst size” from individual bacteria, or the number of viruses produced in one round of multiplication. This was a fundamental discovery, and allowed the rapid progression of the field of bacterial and phage genetics. One important facet of this work was that it showed that infection could be caused by single phages: the power of the plaque assay meant that even dilutions of phage preparations that contained only a single particle could produce a detectable plaque. The Phage Group was started in the 1940s after Delbrück and Salvador Luria – also famous for inventing the Luria broth used to this day to grow bacteria – met at a conference. They soon began to collaborate, and in 1943 published the famous Luria–Delbrück experiment or Fluctuation Test: this showed that resistance to phage infection in bacteria could arise spontaneously and without selection pressure. This was fundamental to understanding bacterial evolution and the development of antibiotic resistance in particular. Also in 1943, they added Alfred Hershey to the group. An important early result of their joint work was the proof that co-infection of one bacterium with two different bacteriophages could lead to genetic recombination, or mixing of the phage genomes. Hershey and his assistant Martha Chase subsequently went on in 1952 to perform the legendary Hershey-Chase experiment in order to prove whether or not DNA was the genetic material of the phage: this purportedly used a new high speed Waring blender Hershey had purchased for his wife, but which never made it to her. This was published as “Independent Functions of Viral Protein and Nucleic Acid in Growth of Bacteriophage“, and essentially cemented the central role of DNA as the material of heredity. “The ghosts represent protein coats that surround the DNA of the intact particles, react with antiserum, protect the DNA from DNase…, and carry the organ of attachment to bacteria”. Subsequent production of phage from the infected bacteria that contained next to no radioisotope-labelled protein, but did contain labelled DNA, showed that DNA was probably the genetic material, and that protein was not involved in phage heredity. Aside from their ground-breaking discoveries, the main influence of the Phage Group was felt via their establishment of the yearly summer phage course at Cold Spring Harbor Laboratory. From 1945 through to the 1960s, Delbrück and colleagues taught the fundamentals of bacteriophage biology and experimentation to generations of biologists, which helped to instill a culture of rigorous mathematical and analytical techniques in attendees – many of whom went on to help establish the emerging field of molecular biology. Indeed, not only did Delbrück, Luria and Hershey receive the 1969 Nobel Prize for Physiology or Medicine for their work on bacteriophages, but Luria’s first graduate student James Watson was also awarded the prize in 1962 for his work with Francis Crick on elucidating the structure of DNA. It is a not particularly well known fact that Watson honed his analytical skills for 3-D reconstructions from X-ray data of DNA with data from TMV, which he helped to show had helical virions. Possibly the most important development for the study of animal viruses since their discovery was the growing of poliovirus in cell culture: this was reported in 1949 by John Enders, Thomas Weller and Frederick Robbins from the USA, and was rewarded with a joint Nobel Prize to them in 1954. They did this around the same time as David Bodian and Isabel Morgan identified three distinct types of poliovirus. While both bacterial and plant viruses could be both grown and assayed in “culture” – bacterial cells for phages, and plants for viruses like TMV – it was very difficult to grow and work with animal viruses, and especially to assay them, or measure their concentration. While the pock assay done on egg membranes for influenza virus was very useful, it was not applicable to many viruses. Indeed, people working with animal and human viruses were envious of the advantages enjoyed by their colleagues working with bacteriophages and plant viruses, because their assay systems were far more generally useful, even if local lesion assays on leaves for plant virus were limited compared to the precision obtainable for bacteriophages using pure cultures of bacterial cells on Petri dishes. Titration or assay of poliovirus, for example, required the injection of virus preparations into the brains of monkeys, or later, in the case of the Lansing or Type II poliovirus strain, into brains of mice. The technological advances that led to the breakthrough were incremental, and in fact had occurred over a period of over sixty years: Wilhelm Roux is credited with creating the first “tissue culture” with animal cells, by maintaining extracts of chicken embryos in warmed saline in 1885. Other early workers had used minced-up chick embryos as far back as the early 1900s; roller-tube cultures had been in use for some time for studying viruses; a number of human and other tissues had been used to culture viruses. Part of the development was, however, the increased ease of making the necessary reagents, such as ultrafiltered bovine serum, and a greater understanding of the requirements of cells for successful growth in culture. Another major enabling factor was the post-Second World War availability of antibiotics, which meant contaminating microorganisms could be killed in culture – which had been impossible previously. Enders, Weller and Robbins started with a suspended cell culture of human embryo skin and muscle tissue – a technique first described in 1928 – with the idea of studying varicella zoster herpesvirus. However, in a case of chance favouring the prepared mind(s), the proximity of these tissue cultures and the Lansing strain of poliovirus in the same lab led to them using this instead, as part of an effort to determine whether all polioviruses exclusively multiplied in human nervous tissue. Their cultures were started by inoculation with a suspension of infected mouse brains, and re-inoculation of mice with tissue culture fluids demonstrated that the virus was multiplying. Injection of fluid into monkey brains after three passages of tissue culture resulted in typical symptoms of paralysis. Later, Types I and III poliovirus were also successfully cultured – and suspended cell cultures of intestine, liver, kidney, adrenals, brain, heart, spleen, lung and brain derived from human embryos were also found to support growth of various polioviruses. Renato Dulbecco in 1952 adapted the technique to primary cultures of chicken embryo fibroblasts grown as monolayers in glass flasks. Using Western equine encephalitis virus and Newcastle disease virus of chickens, he showed for the first time that it was possible to produce plaques due to an animal virus infection, and that these could be used to accurately assay infectious virus titres. He and Marguerite Vogt went on in 1953 to show the technique could be used to assay poliovirus – and went on to show that the principle of “one virus, one plaque” first established with phages, and later to plant viruses, could be extended to animal viruses too. Adaptation of the culture technique to roller-tubes allowed higher yields of virus – and the possibility of direct observation of the effects of virus multiplication on large sheets of cells, rather than in clumps and pieces of tissue from suspension cultures. 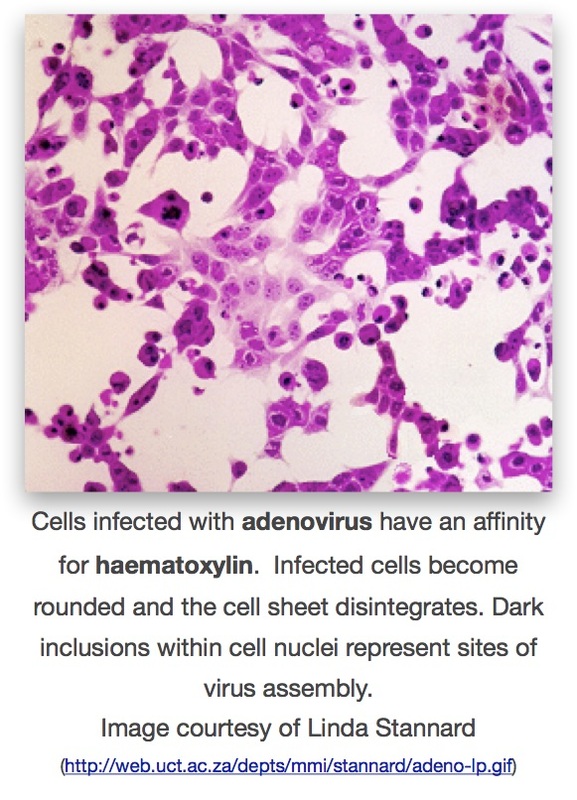 These effects were termed “cytopathogenic” (now generally cytopathic) for the direct damage and morphological changes to cells that could be seen and measured, and roller-tubes made it far easier and quicker to do this by simple staining of cultures with various reagents such as haemotoxylin and eosin. The technique of looking at cells for cytopathic effects (also abbreviated as CPE) quickly found application in assays of infectivity – and therefore of concentration – of poliovirus preparations. It was also possible to do neutralisation assays with immune human sera. There was also the observation that passaging the Lansing strain through cell suspensions reduced its virulence in mice, and similar passage of Type I poliovirus significantly reduced virulence in rhesus macaques. These developments together were part of the advances that led to the development of live poliovirus vaccines soon afterwards. Poliomyelitis – the disease caused by polioviruses – became increasingly common as population densities grew, to the point where in the the USA in 1952, there were 58 000 cases of the disease, compared to 20 000 normally – and up to 500 000 people (mainly children) died worldwide. A failed attempt at producing a vaccine in 1936 by a Maurice Brodie involved the use of ground-up infected monkey spinal cords to produce a formaldehyde-killed vaccine: Brodie tested the vaccine on three thousand children, none of whom developed immunity. Hilary Koprowski in 1948 tested a live type II poliovirus attenuated by passage in rat brains, on himself and a colleague – with no ill effects, but no test of immunogenicity or efficacy. In 1950 he went on to test the vaccine on 20 children in a home for the disabled, with positive results for immunogenicity. It is claimed that Albert Sabin’s live attenuated virus (see below) was supplied by Koprowski; however, events overtook him and the other groups supplied the viruses that have been used to largely eradicate the disease, even though Koprowski went on to do huge clinical trials in Africa. It took the development of cell culture techniques for poliovirus, the finding that there were three distinct types of the virus, as well as the proof in 1953 that immune globulins alone could protect against infection, to enable the successful development of vaccines still used today. This is very well documented elsewhere; this account will summarise the most important features of the development. The 1952-1953 polio epidemics in the US led to major public concern, and national efforts to develop vaccines. Jonas Salk and his team at the University of Pittsburgh. They produced virulent poliovirus types 1, 2 and 3 in culture in monkey kidney-derived Vero cells, and then used formaldehyde to inactivate the viruses to create an injectable vaccine. After trials in animals proved that the “Inactivated Poliovirus Vaccine” or IPV was safely killed, it was trialled from 1954 in what was possibly the biggest medical experiment in history, involving 1.8 million children in the US. By 1955 it was possible to announce that IPV was 60–70% effective against poliovirus type 1, and over 90% effective against types 2 and 3. The vaccine was licenced in 1955, and immediately used in campaigns for vaccination of at-risk children. See heat map showing the number of cases of polio per 100 000 people across the USA. Copyright Wall St Journal, 2015. While the vaccine did not in fact prevent infection by the virus – which infects the gastrointestinal tract via the oral route – it prevented disease by means of eliciting a largely IgG-dependent circulating antibody response, which neutralised any virus entering the circulatory system and thus prevented viraemia and subsequent involvement of the nervous system. This means that it is an excellent vaccine to use as an end-stage weapon in the fight against polio, as unlike the live attenuated vaccine, there is no “shedding” of live virus. While others (including Koprowski) were involved in attempting to develop attenuated live vaccines, it was Albert Sabin’s trivalent live attenuated vaccine that was eventually successful. This was developed by repeated passage in animal and then cell culture, that resulted in the effective abolition of neurovirulence of all three poliovirus types – accompanied by a significant number of mutations in the viral genomes. After a successful safety trial in institutionalised children in the US in 1954, Sabin worked closely with scientists and the authorities in the former USSR, and in particular Mikhail Chumakov, to first manufacture the vaccine, then to perform large-scale clinical trials between “…1955 and 1961, [when] the oral vaccine was tested on at least 100 million people in the USSR, parts of Eastern Europe, Singapore, Mexico, and the Netherlands”. While the US was initially reluctant to use the vaccine, the Russian-made product was distributed worldwide, and rapidly usurped the dominance of IPV. By 1963, however, the trivalent product was licenced in the US, and from 1962-1965 about 100 million doses were used. Advantages of the “Oral Polio Vaccine” or OPV were that it could be given much more easily – as droplets, into the mouth – that it multiplied efficiently in the gut, meaning doses could be small, but not in nervous tissue so that it caused no disease, and that it elicited mucosal immunity that could prevent infection as well as disease. Disadvantages of the live vaccine are that it requires a cold chain for transport, otherwise it loses infectivity; that it can be shed in stools by vaccinees, meaning that uncontrolled community spread is possible. This can result in vaccine-associated paralytic poliomyelitis, either due to reversion of the vaccines to virulence by mutation, or more rarely because of immune deficiencies in those exposed. Because of this, and the possibility of persistence of vaccine strains in populations even in the absence of overt disease, the final stages of poliovirus eradication probably require use of IPV in areas where there is no longer any endemic wild-type poliovirus. While there have been serious concerns about contamination of poliovirus vaccines with live SV40 virus – a known tumour-causing agent – the consensus opinion appears to be that there is no danger. These observations also quickly found application with a wide variety of other human and animal viruses, which triggered an explosion in these fields that led to them rapidly overtaking plant and bacterial virology in terms of understanding how the viruses replicated, and developing assays and vaccines for them. Indeed, the poliovirus work was rapidly followed in the same lab by the isolation of herpes zoster and herpes simplex viruses; the agent of measles was characterised by Thomas Peebles and Enders via tissue culture by 1954; adenoviruses were discovered in 1953 by Wallace Rowe and Robert Huebner and shown to be associated with acute respiratory disease soon afterwards, by Maurice Hilleman and others. This entry was posted on 29 January, 2015 at 14:50 and is filed under biotechnology, Evolution, General Virology, Vaccines: General, Viruses. You can follow any responses to this entry through the RSS 2.0 feed. You can leave a response, or trackback from your own site. great work!i really enjoyed it.